Who has booked their ticket to the Capcom Cup? We’re six months into the first Capcom Pro Tour of the Street Fighter V era and, with EVO behind us, it’s time to take a look at how things are shaking out in the various ranking tables and what this could mean as the Capcom Cup draws ever closer. Who will qualify? How will they qualify? Will anyone miss out? Right now, in the top ten of the Global rankings table, four players have automatically qualified for the Capcom Cup. Infiltration, Tokido, Phenom and Momochi have all won CPT Premier events and have booked their tickets for the big show at the end of the year. The top 8 all qualify for Capcom Cup - but with those four already on their way, anyone sitting in the top twelve has a shot at getting those spots. Justin Wong sits in second place with a likely untouchable 852 points, with Fuudo, EVO runner up, just behind him on 804. Both have almost certainly scored enough points to qualify. Xian, Julio Fuentes, Mago and Haitani make up the rest of the top ten, all of which have had the odd win at a ranking event on their records. Floating just outside the top ten are players who have had consistent results in their region, with one big win all that really stands between them and a top ten position. Players like Yukadon, Problem X, Chris Tatarian and CCL, all playing well and if a few results go their way, could find themselves automatically qualifying for Capcom Cup. In thirteenth place is Xiao Hai, who interestingly has automatically qualified by winning the Chinese Premier event in Shanghai. The top two from a regional ranking leaderboard automatically qualify for Capcom Cup, while places three through ten will battle it out in a Last Chance Qualifier tournament. However, the current top two - Justin Wong and Julio Fuentes - are sat in the automatic global qualification slots. Outside of the top, two the North American leaderboard is still a bit of a free-for-all with any number of players having the chance to qualify for the last chance event. 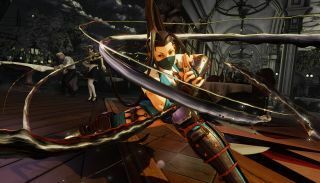 In the rest of the top ten, only Ricki Ortiz and Chris Tatarian have won a ranking event, while XskSamurai was the winner of the first US Online Ranking Event. Should the top two remain the same and both manage to maintain their place in the Global ranking table, then anyone in the top twelve has a chance. There’s a real lack of ranking event winners in the US CPT table right now, and anyone who can muster up a decent run could crack the qualification positions. Hilariously, Justin Wong currently sits at the top of the Latin America leaderboard, hedging his bets with yet another automatic qualification spot. He’s all but qualified through his global ranking, however, so the current two and three would be going through. In second place is his Evil Geniuses team mate K-Brad, who won The Fight 2016 in Bogota, Columbia. In third is the man K-Brad beat in the finals of that event and winner of Lima Salty 3, Misterio, a player who is actually from the region. Many US players are using these Latin American events to gain themselves extra chances to qualify for the Capcom Cup, so it is good to see a player like Misterio winning a ranking event and defending their turf and points from the rest of the world. Right now the top two spots are taken up by two players from the region who have won a couple of CPT ranking events each. CCL - who won FFM Rumble in Frankfurt and last weekend’s VSFighting event in Birmingham - and Mister Crimson, who won the first EU CPT event and the first EU CPT ONLINE event. Phenom, who has automatically qualified with a Premier win sits in third, so fourth through twelfth place will battle it out in the EU Last Chance Qualifier. Potentially, however, these places could stretch further down the leaderboard as Xian, Chris Tatarian and Haitani all hold qualification positions. Mago, Haitani and Xian all hold positions in qualification slots in this leaderboard, so again this presents an opportunity to players outside of the top eight. While automatic qualifiers Tokido and Momochi occupy slots on the fringes, anything could happen in the coming months. Right now, Eita and last year’s Capcom Cup winner Kazunoku will automatically qualify. Relative unknown Chinese player TSE4444 won a ranking event in his home country to grab a good 128CPT points, but after that, everyone is on sub 100 points in this region, including one Daigo Umehara. A lot of Japanese talent has been focusing on picking up points in other territories, so a few players could easily get into the Last Chance Qualifier slots with a top 8 finish or two. Right now, Daigo Umehara isn’t going to Capcom Cup. Neither is Ryan Hart or EVO 2016 American hero LI Joe. Former EVO winner Luffy would have to go through the last chance qualifier for Europe. There's many well known and established players who could lose their slot to anyone who could play the games of their life and win a local ranking event. Two of last year’s Pro Tour standouts, 801 Strider and Keoma, are nowhere to be seen on any of the leaderboards! Both are Abel players, so I feel their pain. Team Red Bull’s USFIV top players Snake Eyez and Bonchan are currently nowhere near qualification.